With all the constant shake-up in Marvel’s first title, 1978 brought in a period of stability. Marv Wolfman's two-year reign as writer wasn't the longest on the title by any means, but after a few years of writers leaving and coming back to the title, plus fill-in issues, it saw something of a sense of purpose back on the book. With Wolfman's appointment, the status quo was almost immediately restored, with Reed getting his powers back (even stronger than ever) and the team regrouping. Departing Len Wein revealed in an interview with this site that the group breaking up was part of a wider plan: "I thought I'd spend a year telling essentially solo stories while setting up all sorts of new subplots that would be important in the year to follow that. But, unfortunately, I left the book before I could do any of the things I'd planned." Marv's first work on the title was the 12th annual of the previous year, and, here, with #190, a "flashback" issue written as yet another fill-in for missed deadlines. Marv's start proper came with #195, before which Len got to say goodbye and Bill Mantlo carried the can for a couple of issues. Of note here is the much-delayed #191, which sees Ben’s first overt reference to religion, as he claims to have been doing a lot of praying since the break-up of the team. However, it would still be twenty-four years before that particular revelation… The story is a touching one, with a genuine break-up of the Fantastic Four, including them ending their rental of the Baxter Building. In fact, there’s so many heart-felt moments that it’s easy to overlook daftness like a villain called The Plunderer and Johnny’s one-off fiery spit. The March issue marks another of Johnny’s liberal attitudes towards the application of racial nicknames – remember him calling Yogi Dakor “Gungadin" way back in issue #23? Here he calls a Native American girl who’s flirting with him (by trying to run him over) “Pocahontas"… and all this in front of Wyatt Wingfoot! This one marks the return of the Texas Twister, who was one of the more successful auditionees for the Frightful Four back in #177. Created by Roy Thomas and Mike Friedrich (an old friend of Roy’s who worked on underground comics) they devised the characters that would audition between them at a comic convention… it being the convention organisers who named him. 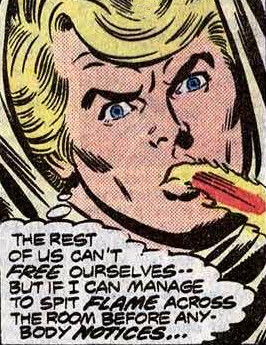 There are some questionable plot developments in this run, such as Reed – a man who can’t even keep up with his married life and fatherhood due to his constant inventing – looking in the situations vacant ads. And if the Baxter Building is up for sale, then what happened to the portal to the Negative Zone? (#201 sees Reed explain to a repairman that the "locking mechanisms" were stored at SHIELD Headquarters, but what of the portal itself?) Most importantly, the run of what amount to virtual solo issues – Johnny vs. the Texas Twister, a two-parter with Ben against Diablo and Sue against the Retrievers - don’t really fully exploit the format as well they might. 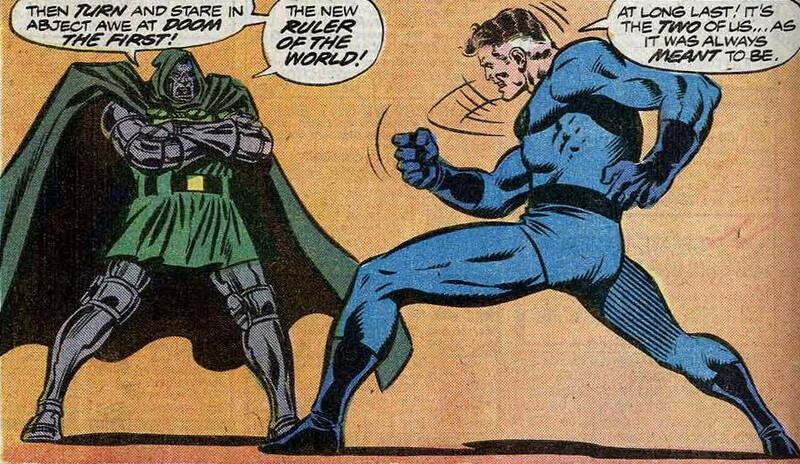 So it is that when Reed regains his powers it’s a moment of glorious triumph, and one that leads into one of the FF’s better epics: a climactic showdown with Reed and Doctor Doom that marks the 200th issue. Reed’s regain of his powers, like Ben’s, results in an improvement of those powers. Now he can stretch much further, and even mould his face into that of a balding elderly man to fool Doom. (How he does the voice though is beyond me). Talking of trivia, then there’s some fun to be had in #196 with Ben, Sue and Johnny getting mistaken for stars while in Hollywood. While there Ben bumps into his idol, John Wayne. Wayne’s final film of 130 had been released the August two years previously… rather sadly, his appearance in the FF seems to follow the real-life curse that had affected Richard Nixon, as he would be dead less than a year later. Finally, speaking of the creative talents behind this period of the book’s history it should also be acknowledged that 1978 brought in arguably the most controversial figure in Marvel history: Jim Shooter. In an age where Marvel was having a new Editor-In-Chief every other month (In just a six-year period the role had been held by Roy Thomas, Len Wein, Marv Wolfman, Gerry Conway and Archie Goodwin), Shooter was drafted in and quickly transformed a company that was losing money into one that controlled nearly 70% of the comic marketplace. Promoted to Vice President in 1981, he continued the EIC position for nearly a decade, during which time his insistence on better pay for creative personnel angered Executives and his tightening on the excesses of creative personnel (including an alleged spat between John Byrne and Chris Claremont, which would be played out in the issues of The X-Men and The Fantastic Four… of which more later) put him in a bad light with pretty much everybody. Though he would never earn marks for his popularity within the industry, and perhaps – as the scribe behind Secret Wars - wasn’t much of a writer, as the most dominant Editor-In-Chief Shooter did steer a company that was becoming increasingly blasé in its output and made it once more a success. For that, if nothing else, maybe history will – in time – come to judge Shooter’s reign more favourably. The return of the Red Ghost was only his eighth story appearance in Marvel Comics, and just his third comeback in the pages of the Fantastic Four. In the meantime he'd become an Iron Man foe, with his atoms being scattered in the events of Iron Man #83. Also of note are the previous exploits of Diablo (which were already cross-referenced from his last appearance anyway) and Namor rebuilding Atlantis from Super-Villain Team-Up #1. Altogether 1978 was a title that could be read in general isolation, without the need to search out other titles.